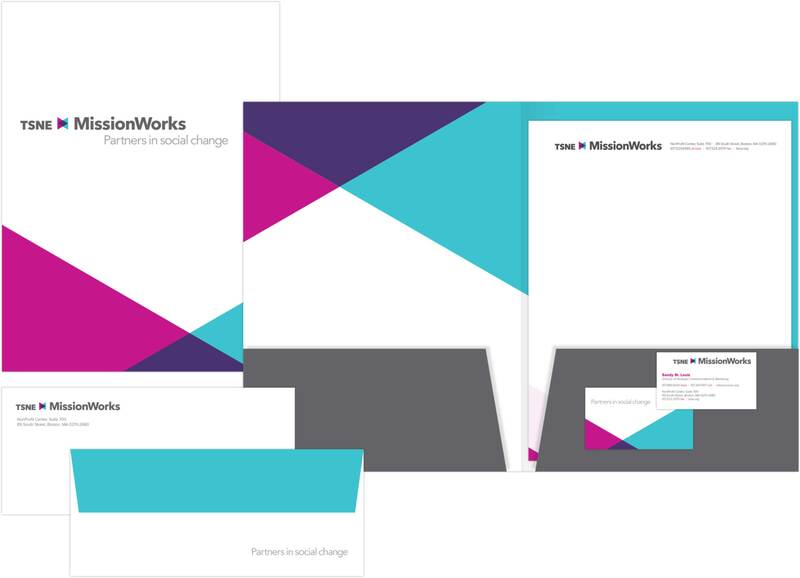 TSNE MissionWorks, formerly Third Sector New England, embarked on their rebranding process in early 2015. They had grown and expanded, their services and offerings had evolved, and their team brought an energy and vibrance to their roles that simply wasn’t captured by their current visual and verbal language. Their new name provides them with a “bridge” from their old moniker to their new one, while their new tagline, “Partners in Social Change” speaks to their commitment to work side by side with each client to realize their unique vision and achieve their goals. A messaging structure with “tilts” for each of their core audiences, along with attributes and storylines, is in place to help communicators tell TSNE MissionWorks’ story in a compelling way. A new mark captures the energy of those partnerships, and the notion that each collaboration they undertake becomes much more than the sum of the partners involved. A pair of elegant new typefaces, a fresh palette, and design gestures that reflect the shape and movement of the mark complete their visual toolkit. With new stationery in hand, an upcoming organizational overview almost on the presses, and a design makeover of their existing site live on the web, TSNE MissionWorks is finally looking and sounding as vibrant as they are.